When you realize that somehow you are abused or something negative has impacted your life, you often tend to question yourself why me? What have I done to deserve this? You may even begin to believe that you are indeed guilty and responsible when others blame you for every tragedy you experience. It turns out to be very difficult to assimilate the devastating effect of being broke, without a penny, full of debt and with bad credit because of the person who was supposed to love you and take care of you “in the good and the bad”. “You should have noticed something when you were dating”, is a common argument your friend will tell you when she realized you´ve been abused by your intimate partner. But this judgmental affirmation won´t help. Feeling the wounds of the financial abuse in your life and your children´s lives won’t help either. 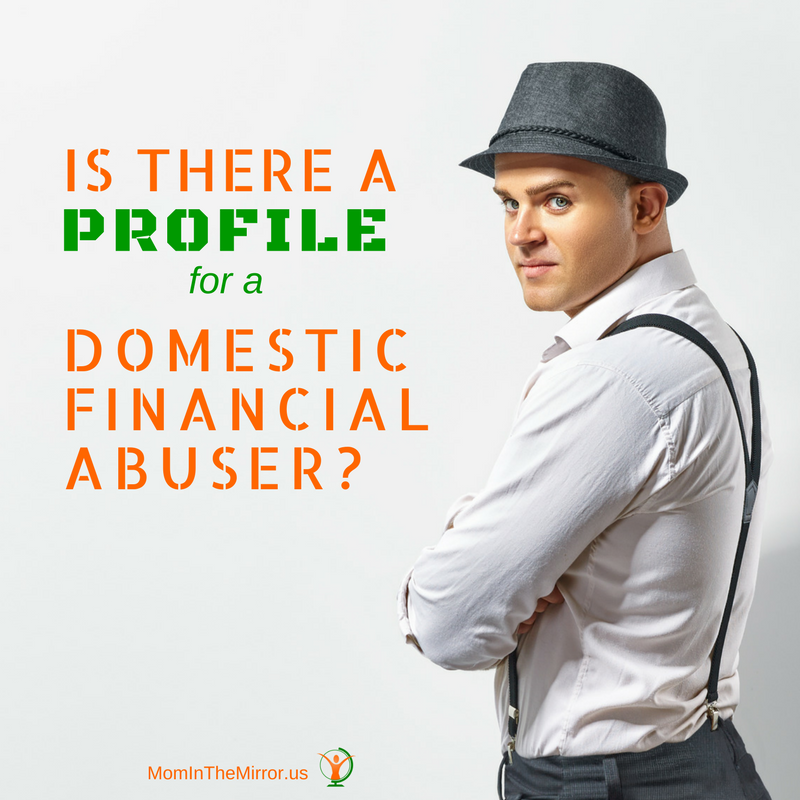 There are certain ways to get out of this awful situation and you may benefit from them, but in order to understand why he´s behaving in that controlling and abusive way, it would be very easy if we could outline a profile for a domestic financial abuser. Most experts state that domestic violence crosses all social, economic, racial, ethnic, age, and religious boundaries, and financial abuse—one of the forms of domestic violence which occurs in 98% of any abusive relationship—is not the exception. What we could state for sure is that there are some risk factors associated with physical and emotional abuse, and—because of the high prevalence of financial abuse combined with these two other forms of abuse—I´ll say they also apply to be risk factors associated with financial abuse in the domestic context, since it is not a money issue, but a key piece of a coercive control strategy. It doesn´t mean that in fact, he is an abuser, but the probabilities for this to be true are higher than if he didn´t match the criteria. 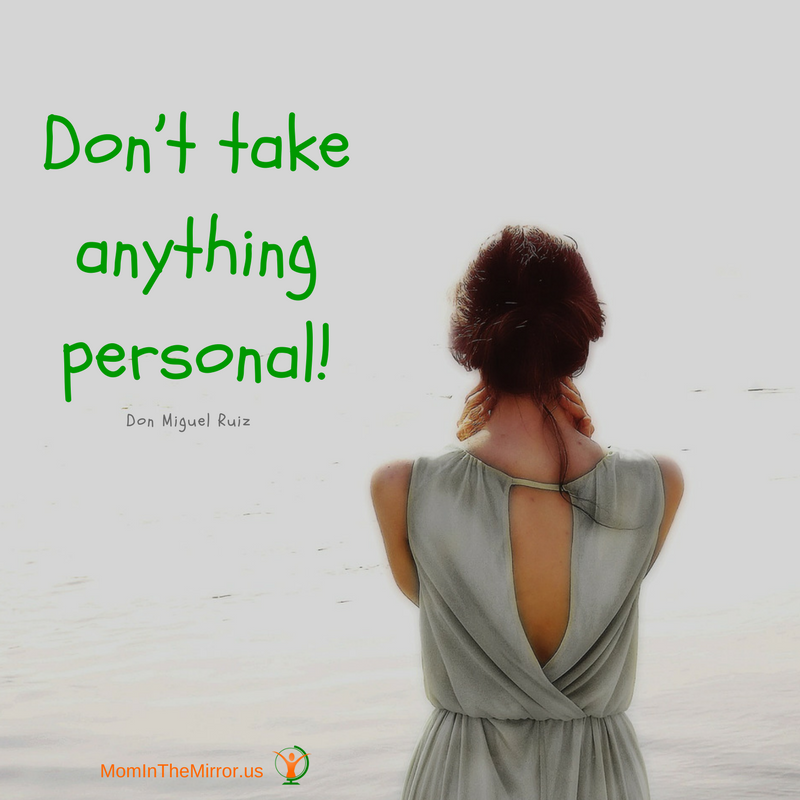 One of my mantras comes from the book The 4 Agreements by Don Miguel Ruiz, that says “don’t take anything personal”. This agreement means that nothing that other person does is because of you. It has nothing to do with you, but everything to do with them. I know it can be hard sometimes to think that when someone is affecting you, causing you suffering, depression, manipulating you, and ruining your financial self-sufficiency, it can be really hard to believe that it is not personal, but trust me, it is not personal at all. It is not about you. It is ALL about HIM. An abuser will beat, manipulate and control any woman he is with, situational circumstances do not make a person abusive. There is nothing that you can do, no matter how good or bad it could be, it won´t help him to control his behavior or change his emotions or attitude. We all own our attitude. And his attitude, abusive temper and controlling behavior is not your fault, not at all. The words of Dr. Susan Hanks, former Director of the Family and Violence Institute in Alameda, California, portrait abusers´ responsibility for their acts and behavior: “The reason why men batter is because of internal psychological struggles”. She didn’t say men need to control his wives because the meal was cold, the clothing was dirty, and the house was unclean. No. Dr. Hanks explained that men do that because they need to feel that sense of power and control over their partners or their own lives. This lack of control along with their codependency and fear for any moves on their partners´ part toward independence are some of the abusers psychological struggles. Controlling. Abusers are very controlling of others, he will want you to be accountable for everything you do, what may be subtle or rude, depending on the stage of your relationship, but it often grows to the point where you are not allowed to make personal decisions about anything, even money. Insecure. His controlling behavior hides a poor self-image; his lack of control over anything and his insecurity. Rigid gender roles. He may hold rigid stereotypical views of the roles of men and women, and parenting, in a relationship. He may also have a clear negative attitude toward women in general, even when he says you´re the only special and different woman he knows, in time, it will lead him to recall you are a woman and don´t deserve his respect. Jealousy. He will be openly jealous and he won´t regret being excessive because he´ll explain that this is a sign of his love and care for you. However, this negative behavior often leads to your isolation from family and friends. Seeking for isolation. By cutting your social connection with family, friends, jobs, and even with social organizations, he´ll be drawing the perfect codependent situation for both of you. Blaming others. If you are with someone who cannot be responsible for anything that is happening in his life, that continuously blames others for his own challenges and feelings, he can turn to be very manipulative on you, making you suffer because he may believe that you are responsible for anything that happened in his life. Unrealistic expectations. The abuser may expect you to be the perfect wife, mother, friend to fulfill all his needs. Since it is unrealistic, it may lead to unfair deceptions and absurd reactions. 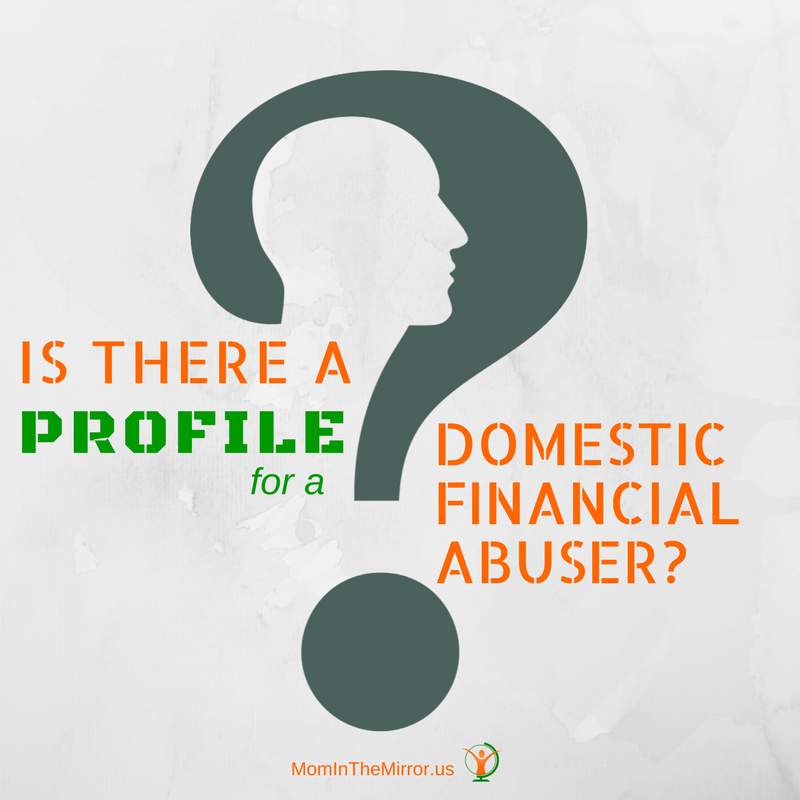 I´ve conducted extensive research in the area of developing a profile for a domestic financial abuser, just to find out that there is no such profile. However, you may benefit from knowing the risk factors that may warn you about your relationship and the characteristics or behaviors that are more common among men who are abusive to their partners. If you are to keep one single idea of this blog post I would love it to be that you fully understand that a man’s abusive behavior is not your fault and even though you cannot stop the man’s abuse, you are responsible for keeping yourself and your children safe. What risk factor and/or characteristic of a financially abusive man do you think we moms are more vulnerable to? Share your insights in the comments. Interesting Read. Among the characteristics listed, i find insecurity and jealousy to be the most common. Women have a really hard time dealing with men who harbor such traits. Unrealistic expectations too is another deal breaker. I wouldn’t blame any woman for coming up with a trick to deal with domestic financial abusers. I have been in a few abusive relationships the first and worst was all kinds of abusive. In the mere months I was with him he racked up 20k (that I know of) of debt in my name. He forged my signature, even pretending to be me on the phone, opened bank accounts in my name, even after we had parted ways he was still setting up accounts using my name, as he stole my ID, NIN and all sorts. I was lucky to have people around who helped me out of the mess with the finances and I have never been there again, although I was so messed up in other ways I jumped from 1 abuser to another as it’s all I knew. It’s tough to be in a relationship like this. You will definitely know the signs by the way they act and it’s important that you learn to let go as early as possible. It’s never going to get better and as you go along, you’ll be unhappy and feel stuck in the relationship. A very good article. I have to admit that I’m not that responsible with money. I’m happy that I have a loving husband. It’s good to know the signs and try to escape as fast as you can. Unfortunately, if you have a child is harder to do so, but you have to think that most likely, he will never change and you deserve to be happy. And if your friends are not supportive, that they are not your friends. I have never been in an abusive relationship but I know that my parents did. They divorced when I was 10, after a relationship that started with abuse, continued normally, and ended with abuse. It’s so hard to witness these things… and I can understand why some people are afraid to leave an abusive relationship. This is interesting. I know someone who was in a relationship with a financial abuser. It didn’t end pretty. Wow. I had no idea that you could profile someone like this. Glad I know what to look for now! Seriously everyone needs this. Thank you SO so much for posting this. Wow, I could barely discern the differences. Abuse is abuse and should not be tolerated under any circumstance. Thanks for touching on this subject. I will send friend or two over to read it. Definitely good points you brought up to look out for in a relationship. Manipulation plays a big role in this for sure, too. Any kind of abuse in a relationship whether physical, mental or something else is still abuse. There may not be the signs when you are dating because they are trying to win you over. This is a very insightful post. I never really thought about this type of thing, I mean it makes sense now that I do think about it. A financial abuser sounds like a scary thing and I am glad there is a profile that someone can use to avoid or detect if they are with someone who fits this bill. This is an awesome post. I can see it helping people dealing with this type of issue. I love that your blog give such great relationship problem advice and tips. Thanks for sharing. I think that the controlling and the unrealistic expectations are pretty bad characteristics. With any relationships, there should be some sort of understanding that it’s a team environment. The couple should work together to achieve a common goal instead of trying to control the other spouse’s finances. I have never heard of this before! These are some fabulous tips to look out for. Now that is a person I would stay away from. You offer great tips, thank you. Wow that sounds careless honestly. I’d be wary of someone like that. your insights are really great!